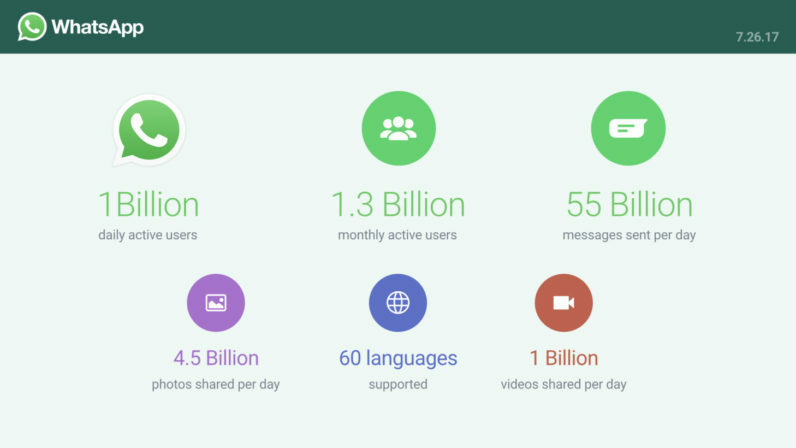 WhatsApp just hit its greatest user milestone yet: 1 billion people now use the app every single day. That’s one out of every seven or eight people on the planet. While WhatsApp hit 1 Billion monthly users last year, it’s now reached the milestone for the people who are bound to the app every day. It’s a sign of Facebook’s continued dominance in digital communications. We don’t have daily active user figures for all of Facebook platforms, but Instagram, Messenger, and Facebook have 700 Million, 1.2 Billion, and 2 billion monthly users, respectively. There are only so many people in the world though – so we wonder where Facebook will go next. Maybe once Facebook can breach China – a country of 1.4 billion where pretty much all its services are banned – we’ll see it grow some more.